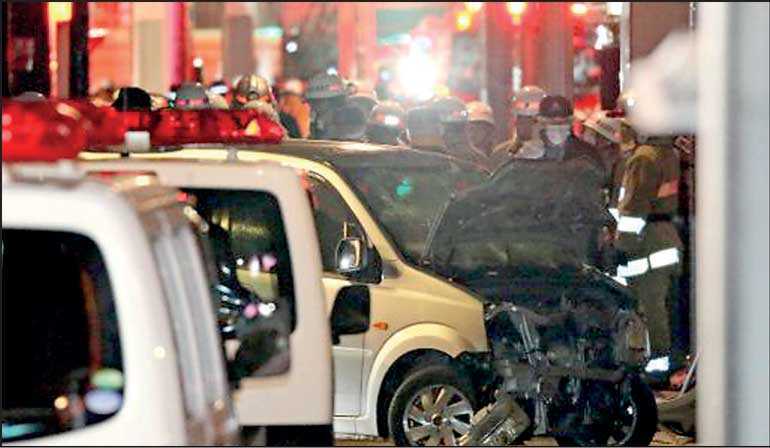 TOKYO (Reuters): At least eight people were injured, one seriously, when a vehicle ploughed into crowds celebrating New Year’s Day in Tokyo early on Tuesday. He was identified as Kazuhiro Kusakabe, 21, from Osaka, a major city about 400 km southwest of Tokyo, NHK said. NHK said the suspect had initially described the incident as an “act of terror” but later said the attack was in retaliation for capital punishment. The street was closed to vehicles at the time of the incident to accommodate the large number of pedestrians making their way to the shrine for New Year’s prayers. TV pictures of the scene on Tuesday showed a grey coloured light vehicle used in the attack, positioned across the street. The front of the vehicle was badly damaged and dozens of police and rescue officials were at the scene. The suspect fled from the scene and assaulted a passerby before he was captured 20 minutes later, NHK said. About 20 litres of kerosene were found in the vehicle. “I learned about the incident later. But I shudder to think. If the incident had happened five minutes later, I would’ve been involved,” a woman who walked past the scene shortly after the incident told NHK. In a similar attack in 2008, a man who said he was tired of life drove a rental truck into a crowd of pedestrians in Tokyo before jumping out and stabbing several people. At least seven people were killed and a dozen injured.